Dogs and cats, like people, sometimes need emergency blood transfusions. But you never see bloodmobiles parked on the street with a line of animal blood donors waiting to make a deposit. So where do veterinary clinics locate blood for pets, and what goes into collection and preparation for a transfusion? The use of blood transfusions for pets has become an important therapy, especially at emergency veterinary clinics. For pets who have lost a lot of blood through injuries or surgical procedures, whole-blood transfusions can be lifesaving. Other animals may benefit from receiving various parts of the blood. Anemic animals, for instance, may need packed red blood cells to help provide supplemental oxygen to the body. And dogs or cats with clotting problems may benefit from plasma and platelets to help stop the bleeding. Animals have different blood types, just like people do. Most cats, for example, tend to be type A, while a smaller number are type B or AB. Dogs have even more blood groups and are designated as DEA (for “dog erythrocyte antigen”) followed by a number. Before blood transfusions are given, most clinics perform a crossmatch, a test that checks for potentially harmful interactions between the infused blood and the pet’s blood. Severe reactions can lead to serious illness and even death. However, once the test is completed and the blood is matched, the team can proceed with the transfusion, which can likely save a life. In the past, small or local practices may have had a “clinic” dog and cat on hand that they used for blood donations, or employees may have even used their own pets. But given the range of blood types that are potentially needed, the time and technology required to process the blood, and more stringent needs to test donors to prevent passing on disease, it is often more practical for smaller clinics to rely on commercial blood banks. Even blood banks face complications, though, as blood products can only be frozen for so long before they reach expiration dates. Because of these factors, many smaller clinics may refer pets that need transfusions to emergency veterinary clinics and veterinary schools that use more blood products on a regular basis. 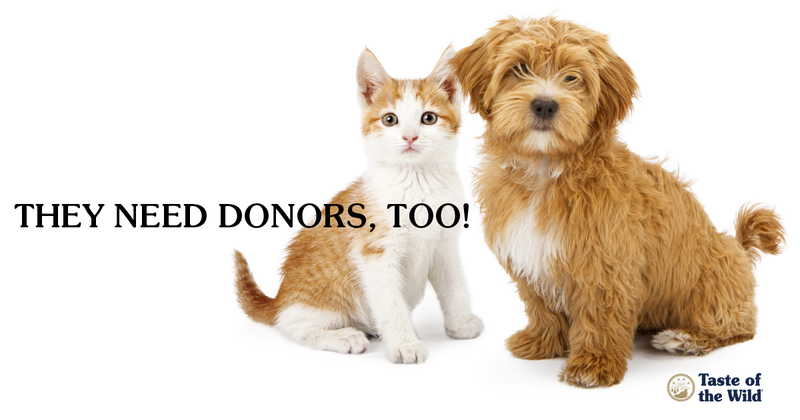 Could Your Pet Be a Donor? If you think your pet might be a candidate, ask your veterinary practice if it needs blood donors. Or ask if your vet can recommend a nearby university or emergency clinic that has a blood donor program. Most programs will require a physical exam and blood tests to see if your pet qualifies. The best blood donors are younger, healthy, easy-going dogs and cats that are tolerant of being handled. The organization may have additional requirements such as a minimum size (generally 50 pounds or more for dogs, 10 pounds or more for cats) and that the pet be current on vaccines as well as all parasite preventives. Your dog or cat should also be free from infectious diseases, including feline leukemia virus, feline immunodeficiency virus and tick-borne diseases. Retired racing greyhounds often make good donors because of their typically gentle demeanors and their larger size. Many also have universal blood types. Once you pet has gone through the screening process to be a blood donor, the organization usually asks that you commit to a certain number of donations per year. You may be asked to fast your pet and then drop him or her off for a few hours while the blood is collected. Most dogs don’t need anesthesia, but some cats might. The whole process only takes 15 to 30 minutes, and is as safe as typical human blood donation. The staff will make sure your pet is calm, comfortable and ready to be sent home with a treat. In exchange for your kindness, the organization may provide your pet with free food, preventive medications, physical exams or other perks. Best of all, you’ll have the satisfaction of knowing you and your pet could help another dog or cat in need. And isn’t that what makes it worthwhile?